Has it really only been four years? Four years since Canabalt ($2.99) burst onto the scene and arguably created and inarguably popularized a genre? Looking around the App Store today, it’s hard to remember a time before endless runners, let alone the idea that it’s all happened in less time than it took to make a fourth Spider-Man movie. The genre has certainly built quite a bit on top of the framework set by its originator, as well. Perspective changes, missions, power-ups, level-ups, currency, vehicles, mini-games, character customization, and more have been added to the genre, resulting in amazing games like Temple Run (Free), Punch Quest (Free), and Jetpack Joyride (Free). Still, as we felt when we recently took a look back at Canabalt, there’s something about the game’s minimalism and tight mechanics that allow it to continue to stand out among the razzle and dazzle of its successors. I’m talking about all of this because in many ways, Boson X ($2.99) seems to have discarded almost all the frills and gimmicks developed in the last four years of evolution, going back to the core of what made Canabalt such a great game. There are no coins to pick up here, nor can you collect power-ups or count on upgrades to make your character stronger. There is your character, the path ahead of him, and precious little in the way of mercy. Momentum and lightning fast reflexes are the key to survival. That’s not to say that the game ignores its contemporaries entirely, because there is a healthy splash of Super Hexagon ($2.99) on the canvass here as well. Like that game, Boson X is both endless and not really endless. You play as a scientist trapped inside of an experiment, running and jumping from platform to platform, with the slightest misstep resulting in annhilation. By running along certain special platforms, you’ll build up a percentage meter, and once it reaches 100%, you’ll discover a new particle, and the speed will pick up significantly. 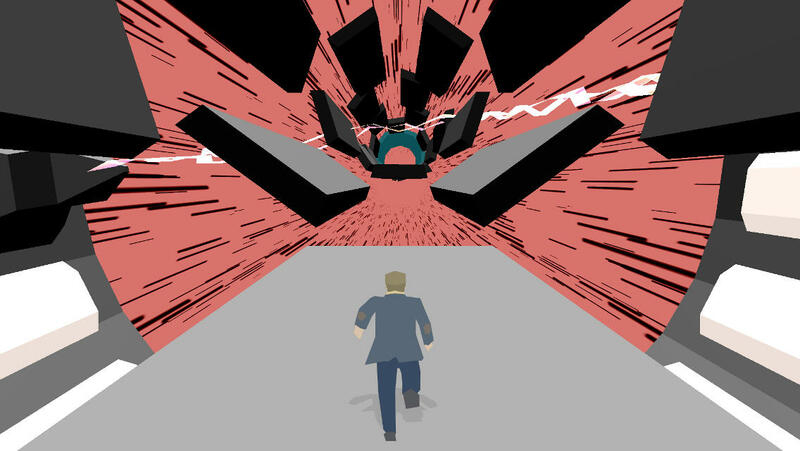 Once you’ve discovered the particle, you will have unlocked the next stage, and are free to move on, but if you have the skills, you can keep running as long as you’re able. Also like Super Hexagon, your movement is rotational. The platforms broadly form in the shape of a tunnel, and you can move clockwise or counter-clockwise around it, one jump at a time. That’s all your character can do, in fact. Jump left, jump right, or jump forward, all accomplished by touching either side of the screen or both sides at once. The longer you hold the touch, the longer he’ll stay in the air, and this dude’s hang time could put Jordan to shame. Like any runner, the game will move faster the longer you play, but, as in Canabalt, there’s an advantage to that in Boson X. You can jump farther the faster you’re running, which is vital to clearing some huge gaps you might encounter if you choose your path poorly. There are six different stages to the game in all. What’s remarkable is that each stage actually feels quite different to the next. Certain obstacles will show up more frequently in some stages than others, and although the stages are randomized to an extent, you can definitely feel a theme for the hazards of each one. Suitably, each stage also its own unique look and sound. A lot of that is down to color choices, but as with the hazards, certain design elements will be unique to each stage. Boson X demands that you learn new strategies for each level and insists on your lack of comfort. As you would expect from a game that feels like the progeny of Canabalt and Super Hexagon, it’s a very challenging game, and you’ll need to find your way into that wonderful place we refer to as the zone to make much progress. Fortunately, finding your way into that zone isn’t too hard. The game’s visuals and soundtrack will give you a lot of help with that task. It’s a fairly simple looking game, with a lot of flat-shaded objects and a purposely limited color palette for each stage. Your character stands out nicely against the background, with his suit evoking the lead of Canabalt, but pocket patches telling you he’s a professor. Important objects like unstable platforms and the important research platforms are all given their own unique color to ensure that they, too, stand out from the rest of the course. The music, a mix of synth that calls to mind 1980s science fiction, is unique to each stage, and sets the pace perfectly. The UI is excellent, giving the appearance of an experiment while maintaining accessibility. Importantly, the retry button is right where you’re going to want to jam on it after failing for the 20th time. Boson X will not offer you a bread crumb trail of rewards or new hats. It’s not going to ask you to come back every day for a daily reward, and it has no IAP to sell you. Its only offer to you is the challenge of unlocking all the stages, and beating the best scores you and your friends have set down. Yet, somehow, through a mix of style and very measured mechanics, it’s an amazingly compelling game. It’s my opinion that with this game, we finally have the behind-the-back response to the side-scrolling Canabalt. Sure, it wears its inspirations on its sleeve, but sometimes, inspiration leads to brilliance, and so it is with Boson X.